Buyers are overwhelmed by the sheer volume of content that is being pushed their way on a daily basis but underwhelmed when it comes to quality and relevance. Campaign-based marketing and static nurture programs do not adapt to the buyer’s needs and are typically misaligned to the buyer’s stage in their decision-making process. Designing a strategic content model, friendly to Demand Generation requirements and focused on the buyer’s process get prospects more engaged and converts them to sales at higher rates. But how do you do it? ANNUITAS VP of Strategic Content Jason Stewart will share how getting the most from content is not about how much content is produced. It is about developing the right content that aligns to the buyer(s) and their purchase process. 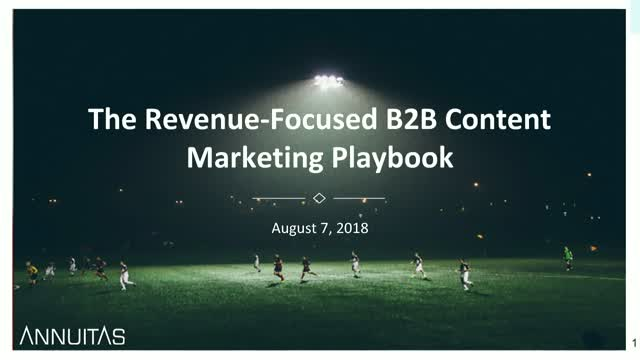 Move away from tactical, volume-based campaigns and into a strategic, holistic Demand Generation content program that serves the needs of the buyer at every stage of their buying process.